Peanut Butter Oatmeal Chocolate Chip Cookies...or should I just call them "Omg Cookies" because Omg they are so good!! I came across this recipe when my husband was on his deployment to Afghanistan. I tried to make him a care package at least once a month. Going out buying things, decorating his boxes, and sending baked goodies made the deployment a lot easier on me because I was so excited to make them and hopefully send a smile to his face. I would send his favorite candy bars, toys for him to play with, body care products, cute laminated pictures of us, and other things. He wasn't big on sweets or even cookies, but I loved to bake for him anyways. I have a food sealer so I would bake him cookies, seal them up, and send them over seas where they hopefully still tasted chewy and delicious when he got them a month or more later. While he was gone I joined a military spouse support website where military girlfriends and wives would share stories, advice, recipes, ideas, etc. I came upon this recipe and instantly knew I had to try them! This cookie had everything good from other cookies all in one! When I talked to Levi about the cookies he recieved he said my cookies had fallen apart because I vaccuum sealed them :( but the crumbs were devoured anyways by all of the guys! YAY! I was happy I could put a smile on their face when they were so far away from home. - Stir together brown sugar and butter until blended. Stir in vanilla and egg until light and fluffy. - In another bowl mix oats, flour, baking soda, and salt. Mix into the brown sugar mixture. - Stir in chocolate chips and peanut butter. 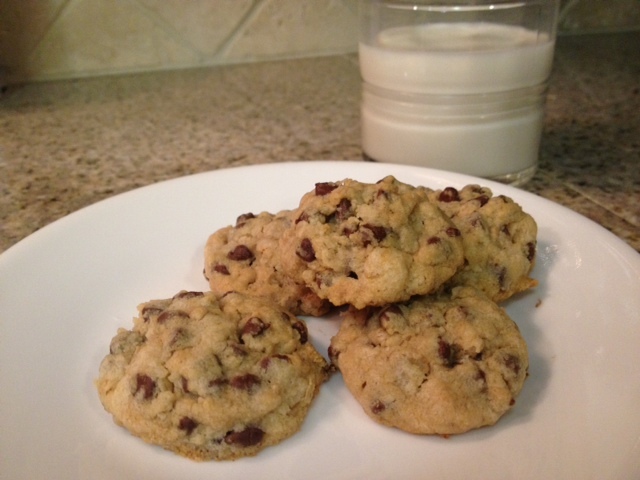 - Drop by spoonfuls onto ungreased cookie sheet and bake 9 - 11 minutes. - Cookies will harden up after cooled so do not wait until they are hard in the oven to take out. OPTION: You can add nuts or even leave out the peanut butter if you are allergic.